Kick off your visit on the 23rd (Thu): explore the fascinating underground world of Catacombs of Milos. 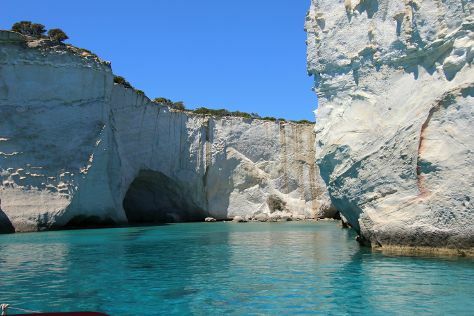 To see other places to visit, reviews, ratings, and tourist information, go to the Milos trip planner. Cairo, Egypt to Milos is an approximately 5-hour flight. 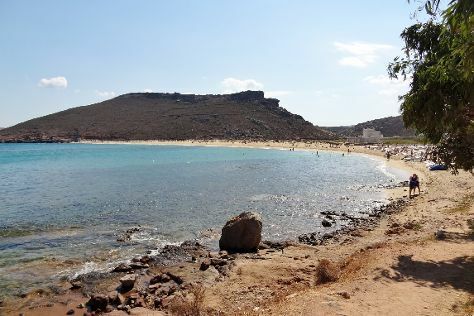 When traveling from Cairo in August, plan for slightly colder days in Milos, with highs around 34°C, while nights are about the same with lows around 27°C. Finish your sightseeing early on the 24th (Fri) so you can fly to Platys Gialos. Playtis Gialos, a popular resort on Mykonos, serves as a convenient starting point for regular sightseeing tours of the island's southern coastline. Start off your visit on the 25th (Sat): kick back and relax at Panormos Beach, then take in the spiritual surroundings of Paraportiani Church, then don't miss a visit to Rarity Gallery, and finally make a trip to The Windmills (Kato Milli). Keep things going the next day: kick back and relax at Paradise Beach, kick back and relax at Kapari Beach, and then kick back and relax at Platis Gialos Beach. To find traveler tips, photos, more things to do, and tourist information, use the Platys Gialos journey planner. Traveling by flight from Milos to Platys Gialos takes 3.5 hours. Alternatively, you can do a combination of ferry and taxi; or do a combination of ferry and bus. In August, daily temperatures in Platys Gialos can reach 33°C, while at night they dip to 27°C. Finish your sightseeing early on the 26th (Sun) to allow enough time to travel to Athens. Athens is known for historic sites, museums, shopping, nightlife, and fun & games. Your plan includes some of its best attractions: explore the ancient world of Acropolis of Athens, make a trip to Ancient Agora of Athens, admire all the interesting features of Panathenaic Stadium, and take a stroll through Plaka. To see photos, more things to do, and other tourist information, go to the Athens trip itinerary maker tool . Traveling by combination of flight and subway from Platys Gialos to Athens takes 2.5 hours. Alternatively, you can do a combination of car and ferry; or do a combination of bus and ferry. When traveling from Platys Gialos in August, plan for a bit warmer days and about the same nights in Athens: temperatures range from 39°C by day to 29°C at night. Finish your sightseeing early on the 29th (Wed) so you can travel back home.